WHY IS THE PRICE SET WHERE IT IS? Pro Art Consulting is the type of book that will only appeal to a small segment of society - a niche market. It is also not meant to be read by the masses because the purpose is to equip a select few people in the business so that there is plenty of opportunity for all to build a successful business. Therefore, the smaller the niche market and the more proprietary the information, the higher the price. But when you also consider that the author promises to be there as a supportive and informative source beyond the material covered in the eBook, this one factor alone makes the eBook an incredible "steal". The training you will receive in this eBook is not available any where else on the planet. This information is so proprietary the author actually could ask a whole lot more for it since the expertise was gained over 20 years of trial and error and just plain hard work. But she wants to make it affordable too. But even that's not totally why the price is set as it is. Pro Art Consulting is a business concept that requires follow thru on the apart of the student for there to be success. It does no one any good if the training you receive is set aside and not acted upon. Statistics show that there is better follow through when a more significant amount has been paid for the training than if the training were less expensive. Recognizing that many people have poor follow up skills, the price will hopefully serve as a bit of an incentive to motivate you to work the business and gain BACK your eBook expense from your first client. If the average client pays $3000-5000 for a small to medium sized art concept, you'll not only cover the cost of your training instantly, you'll generate a handsome profit on top of that. So we hope you can see, that we've done everything we can to provide you with some top notch training eBooks that will teach you all you need to know to start, build and manage your own art consulting business as a corporate art consultant. You can work from your home at your own pace. You take the training in the comfort of your own home at your computer and you don't have to travel anywhere. You will gain all of the advice, expertise and benefits by learning from someone who invented this method of corporate art consulting in 1983. And you'll be able to write the author for personalized help, after you've read her eBook, should you need it. So you tell me, what is all that worth? A good deal more than the price we are charging. IS THERE ANOTHER WAY TO PAY FOR IT? Well, we thought about offering a payment plan, but really, you have a payment plan already in place on your credit card. Buy the eBook, read it while you're waiting for your statement to arrive. Make installment payments to your credit card until the eBook is fully paid. The point is, if you're looking for a way to generate money in the design and art field, and you do not have any training, this is the perfect business for you. Don't let a few dollars get in the way. Don't look at it as the price of an eBook, but rather an investment in yourself and your future, because that is really what it is. My Investment in My Future Art Consulting Business. Start a new career as a prestigious corporate art consultant. Create beautiful offices for businesses with custom framed art and installation services. No art degree needed. No experience needed. Train at home at your own pace. 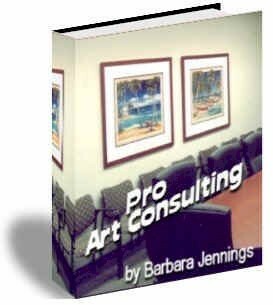 Barbara Jennings, a 20 year consultant, teaches you how to start your own home-based art consulting business. Decorating a beautiful party is an excellent way to get new clients and referrals. It's a great way to network and build your business. It's also a lot of fun and very creative and rewarding. Learn how to hang artwork, pictures, mirrors, shelves and anything else you want. Don't wind up with 25 holes back of your art. Know where to hang it, at what height and get it up right the first time. Get free tips, discounts, notice of special sales, new product announcements sent to your email automatically ($147.00 value). This is a double opt-in newsletter. You must confirm your request when asked to do so by email. We respect your privacy and will never share your information with anyone. Be sure and whitelist our server at "decorating.listserve.us" so our newsletter doesn't get put in your spam mail logs. Confirmation Response is Required when notified by "ListManager" to do so. Make incredible income as an interior redesigner and/or home stager. Work from home. No experience necessary. No expensive seminars. Train at home. Feel proud of your career. Be the envy of your friends. Gain respect from your family and relatives. Make money having fun. Completely redecorate any room in your home in half a day. Learn the secrets of interior designers using the furniture you already own. Arrangement techniques are easy to learn and apply. Impress your spouse, children, family and friends. Learn how to create exquisite floral arrangements for your home, as gifts or to sell in your business. Every woman loves flowers and floral arrangements are the finishing touch to any room. Learn how to design wallgroupings that are breathtaking. Declutter your home by grouping pictures, art, mirrors, shelves. Learn how to hang artwork near and around furniture.